To help celebrate Candis Magazine’s Outstanding Family of the Year Award, Littlewoods.com is offering five Fuji Digital Cameras to the winning families so they can capture the excitement of the awards day this year. The Fuji JX550 Digital Camera has a 16 megapixel resolution for high quality images and its wide range of features, including red-eye reduction, face detection, view finder, optical zoom and changeable lens will help create that perfect family photo. With the awards show being held at London Zoo this year we guarantee that there will be plenty of photo opportunities and with camera in hand, memories of the day are only one click away! Skin Health Spa sets itself apart from a typical high street beauty salon with its sophisticated list of new and advanced treatments available across six clinics. The spa of choice for many celebrities, Skin Health Spa has treatment centres in London, the Midlands, Manchester and Cheshire, and have given each of the Outstanding Family Award category winners a £55 voucher to spend at their nearest clinic. Treatments offered include skin rejuvenating laser treatments, anti-ageing and wrinkle reducing options, acne scarring treatments, permanent hair reduction, pioneering Dermal Roller facials, plus more traditional waxing, indulgent facials, massages and spray tanning. To find out more about the array of treatments available including the groundbreaking Ultimate Facial – a favourite with celebrity clients – visit www.skinhealthspa.com. Prezzybox are thrilled to donate five iMusic Waterproof MP3 Players to the Candis Outstanding Family Award category winners. The five deserving Candis Outstanding Family Award category winners will each receive a Vango Tigris 400XL tent and four Sonno Comfort sleeping bags. The Tigris tent is a Vango bestseller and has been updated for 2012 to include an added front pole, which doubles the living space inside and creates an area ideal for storage or relaxing. Perfect for a family holiday, the Tigris sleeps four and includes large windows to let in plenty of light, plus privacy curtains and hanging storage. Part-mesh inner doors separate sleeping areas where a restful night is bound to be had by all due to the incredible softness of the Sonno Comfort sleeping bags. Ideal for usage nearly all year round, the Sonno is designed for temperatures between -5-15C and also includes hanging loops and a two-way zip guard. A perfect family camping package! The Micro Sprite is an excellent all-round scooter, especially for people who’ve not used a two-wheeler before. But while scooters are usually the reserve of children and teens, the beauty of The Micro Sprite is that adults can enjoy it as well. Parents who have children who scoot to school no longer have to run to keep up and will get some fun, healthy exercise too. With summer here, what better way to encourage the family to get out into the fresh air and beat the boredom of the long summer holidays? Which is why we are happy to provide five Micro-scooters to the category winners of the Candis Outstanding Family Award. The Micro Sprite is Swiss designed and features a lightweight frame, tough PU wheels and an easy folding mechanism, making it perfect to pack away and take anywhere. It is suitable from the age of five years to adult and is priced at £52.00. For more information about the range of Micro Scooters available for children and adults visit www.micro-scooters.co.uk. Pure’s One Classic Series II is a DAB digital and FM radio that looks great, sounds fantastic and is easy to use – and we’ve given five of these stylish radios to each of the Candis Outstanding Family category winners. With a new Listen Later feature that enables you to save your favourite programme and play it back later, a smooth satin-touch finish, a choice of colours, an input for your iPod/MP3 player and digital radio pause and rewind, One Classic Series II has something for everyone. If you haven’t experienced digital radio yet, you’re in for a treat. There’s more station choice, easy station selection, extra information on the display and crisp, clear digital-quality sound. One Classic Series II offers hours of portable listening per charge of the optional rechargeable ChargePAK C6L, reducing the cost to you and to the environment. Alternatively you can use six standard C size alkaline batteries. Features also include FM with RDS, Intellitext, textSCAN, kitchen and sleep timers, a backlit display and USB upgradeability. Mookie Toys, owners of Swingball, are proud to support the Outstanding Family Award hosted by Candis, recognising and rewarding families that make a real difference. Five All-Surface Swingball games have been donated by Mookie Toys. Swingball is a classic brand with a heritage stretching back more than 30 years and is officially one of the top ten bestselling toys of the last decade. And with summer here, there’s no better time for families to turn off the TV, head outside and have fun with an energetic match of Swingball. Fully portable, it is the perfect game for any outdoor event, holiday fun and picnics. It’s fun, interactive and great for all age groups and genders – but watch out as it tends to bring out that competitive streak in even the most unlikely players! So let’s get families out in the fresh air playing games and having fun! www.swingball.co.uk. University Games sell an extensive range of family games and puzzles that encourage interaction, fun and learning between friends and family – so supporting the Outstanding Families Award 2012 with prizes for the category winners was a pleasure! They have offered five Eric Carle ABC Games, which recreate the popular illustrations from the much-loved children’s book and introduce the alphabet to young children. It’s easy to learn and fun to play for both children and adults. Amazon £9.99, www.universitygames.co.uk. 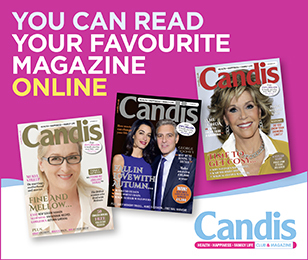 Denby is delighted to be supporting the Candis Outstanding Family Awards, giving five 16-piece dinner sets as prizes. Each set comprises four each of dinner plates, salad plates, soup/cereal bowls and mugs. Denby is fortunate in having a long history of craftsmen and women at the Derbyshire Pottery who have passed their skills on from generation to generation, often training their own family members. The Denby product has evolved over the last 200 years with changes very much representing social history. Throughout this time Denby has always been intended for everyday family use and today keeps pace with modern life, being suitable for the dishwasher, oven, microwave and freezer. As durable today as it’s founder intended in 1809, we are proud to be part of family life in households both nationally and internationally. Caterpillar, the world’s largest maker of construction equipment, was delighted to support the Candis Outstanding Family Awards, giving five goodie bags containing a variety of items including hats, T-shirts and Caterpillar model to the winning families. Merlin Entertainments Group, The No 1 visitor attraction operator in Europe is pleased to provide family tickets for each of the five category winners of the Candis Outstanding Family of the Year Awards. Each winning family will receive four tickets for one of Merlin’s fantastic attractions for the 2012 season. Merlin operates an international portfolio of attractions, among them are many of the world’s best known brand names – Madame Tussauds, The Dungeons, Alton Towers Resort, LEGOLAND, SEA LIFE, The EDF Energy London Eye and many more! Congratulations to the winning families. Haven Holidays are proud to be sponsoring the Candis Outstanding Family Awards 2012. Each of the five lucky category winners will win a three-night weekend (Fri-Mon) or a four-night midweek (Mon-Fri) self-catering holiday for a family of up to six people. They will choose from a Standard Plus or Superior two-bedroom Holiday Home at any of the 35 Haven Holiday Parks during April or May 2013 (excluding Bank Holiday periods). Moko Chocolates is an online chocolate shop, delivering quality Belgian, Swiss and English chocolate treats across the UK. Gifts start from £7.99 and include FREE UK delivery and personal message. To find out more, visit www.mokochocolates.co.uk or call 0800 027 3387. Five Qskin DNA Night Creams have been donated by Planet Health International for The Candis Outstanding Family Awards. Qskin DNA Night Cream is a hydrating and replenishing formula complete with plant actives, antioxidants and the moisturising properties of avocado, jojoba and shea butter. It provides superior antioxidant support, helping to regenerate the skin during sleep for the appearance of healthy, revitalised skin. Gently fragranced with pure lavender and sage essential oils, the Qskin DNA Night Cream also helps to relax the mind and promote restful sleep. Also included in the goodie bags are DVDs, designer perfumes and sweets!